It's the middle of July so that means it's time to head to Holbrook! 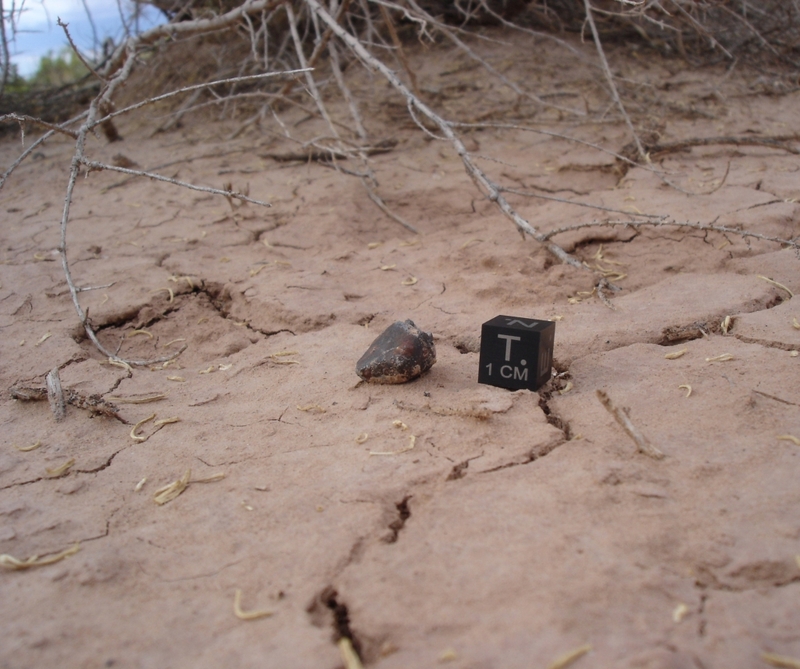 It's been 102 years since meteorites fell there and we were pretty sure there were still a few more waiting for us to find them. 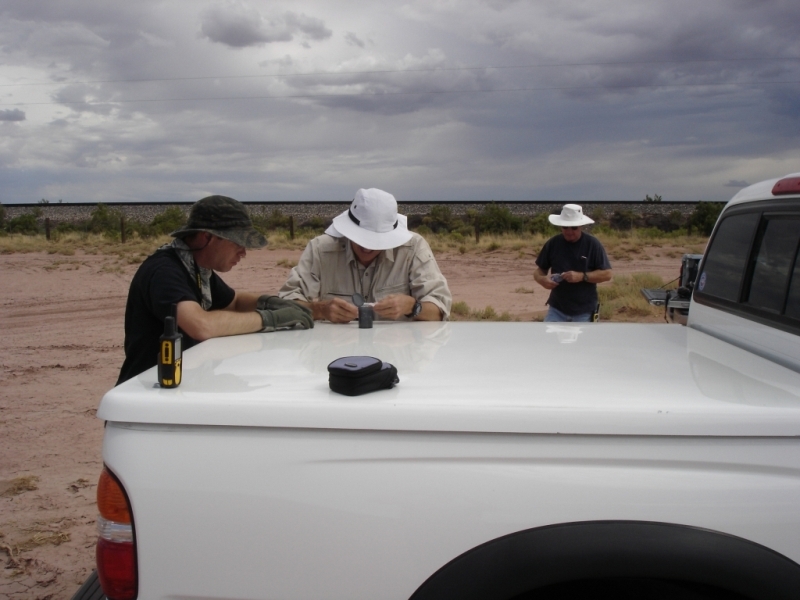 I drove out with Mark and met up with Robby, Bob, Erik, and Ben for a couple days of meteorite hunting in central Arizona. 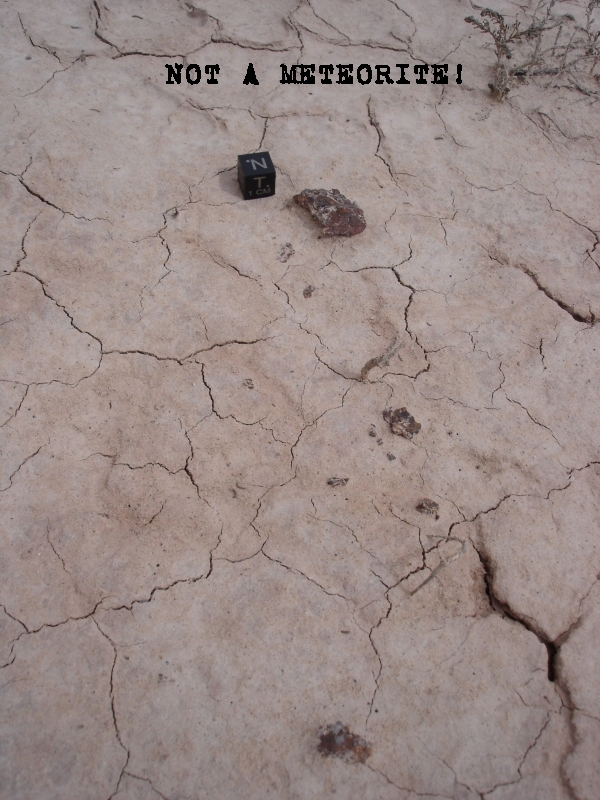 Mark brought along a couple of his recent dry lake finds and showed them to Robby and Bob before we started hunting. 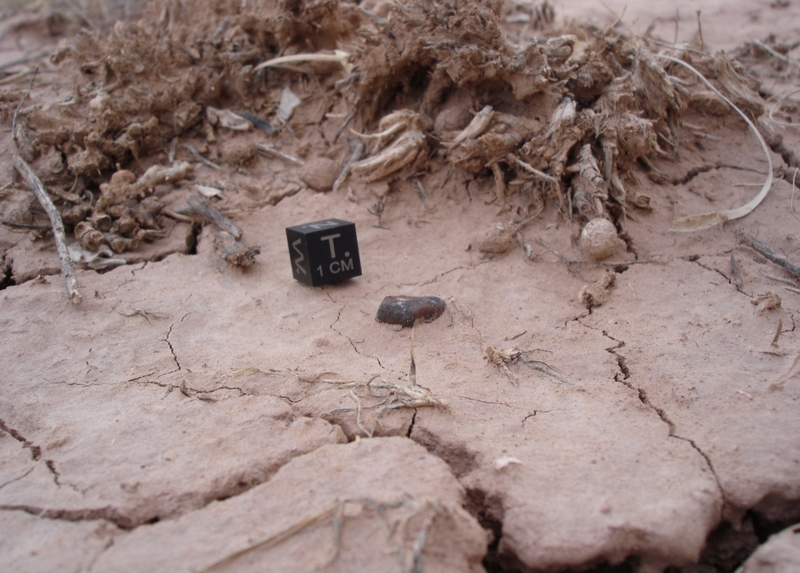 We headed to the south side of the strewn field with the intent of getting Bob his first Holbrook find. 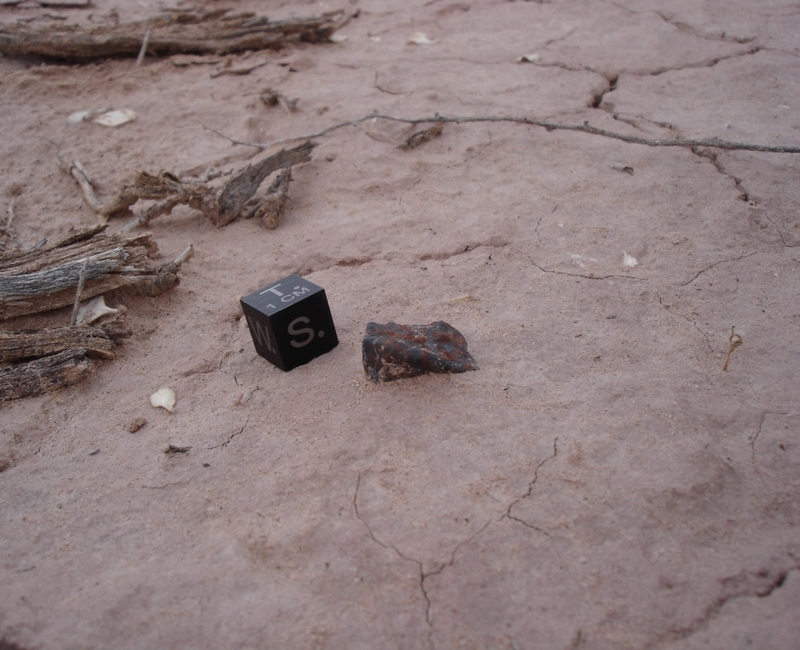 Bob has been hunting there with us every year since 2011 but had never managed to find a meteorite; we were bound and determined to change that this year. I pointed him in a direction toward some bushes where I had a feeling a few might be lurking, while Robby and I headed the opposite direction to check around where we had found a couple last year. Within an hour of starting the search I called out, "Got one! ", I thought I had found one that had fragmented into several pieces, but upon closer inspection it turned out to be some old rusted iron. It sure fooled me for a second, though, enough so that I took a picture before I disturbed it. Not to worry, just a few minutes later I spotted one and this time there was no second guessing. 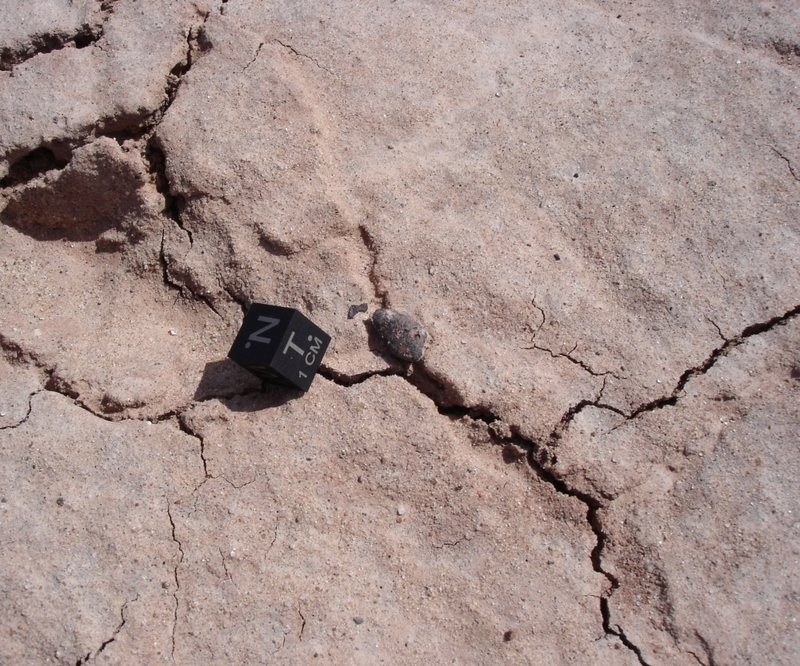 It weighed 3.6g, was partially embedded in the sand, and shaped like a nose cone. I yelled over to Robby who wasn't too far away. 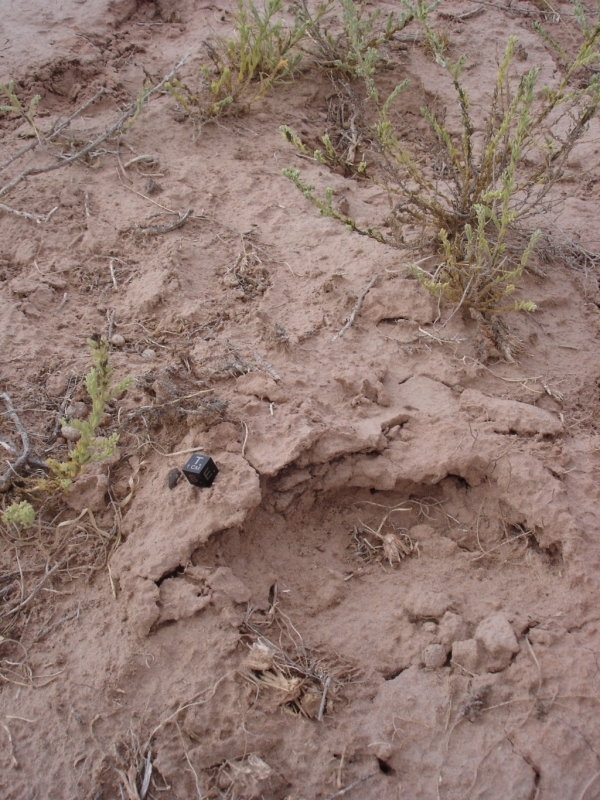 As he walked toward me to see the find I remembered last year where he found a really nice meteorite right next to one of mine, so before he could get over to me I starting running around to see if there were any others in the immediate area. 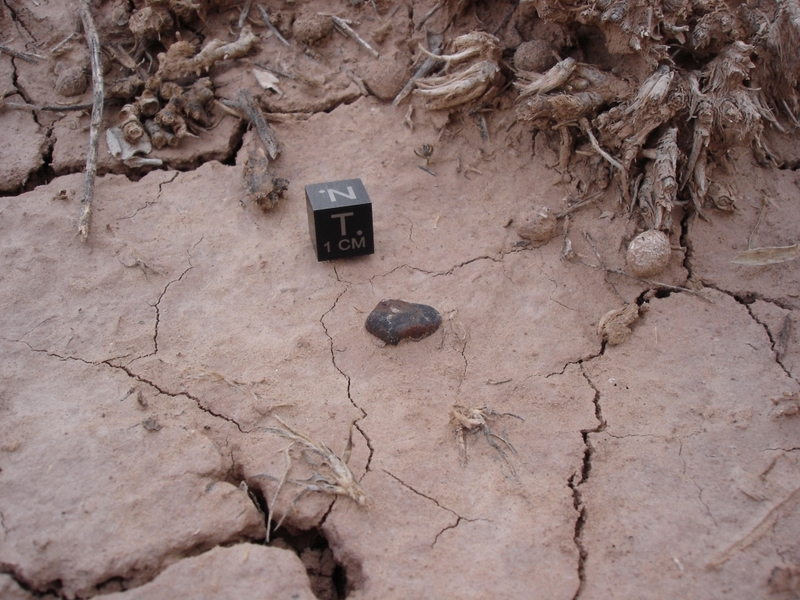 Sure enough, I found a 1.3g meteorite just a few feet away. We headed back toward Bob whom we could see in the distance. As we got closer we radioed to him that he was a bit too far out and should turn back toward the railroad tracks and meet up with us. I got to him first and asked if he had found anything. 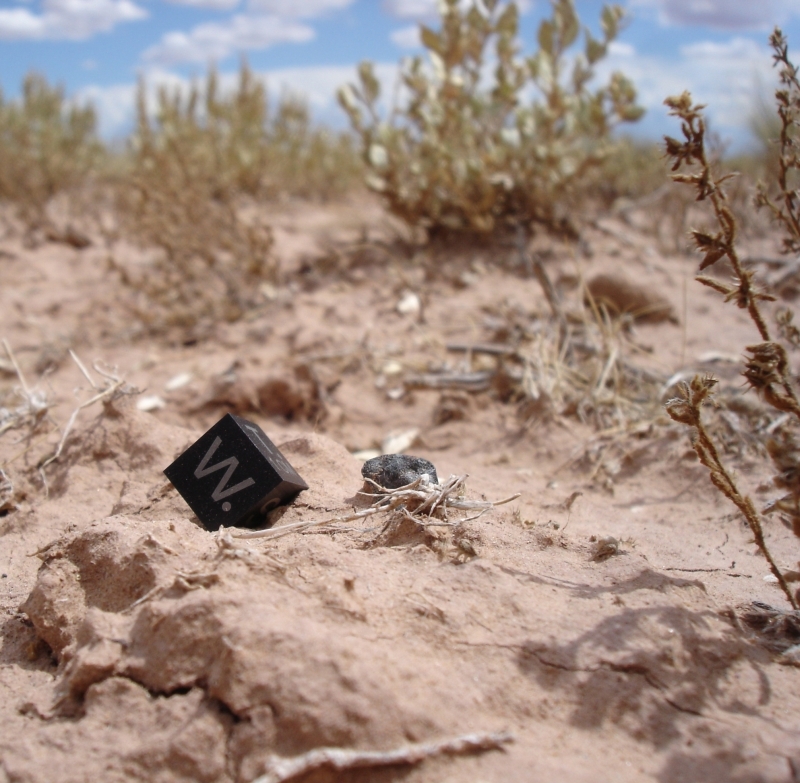 He told me he found a meteorwrong that stuck to his magnet just as he turned back to the tracks after we radioed him, and was so frustrated that he almost threw it away. 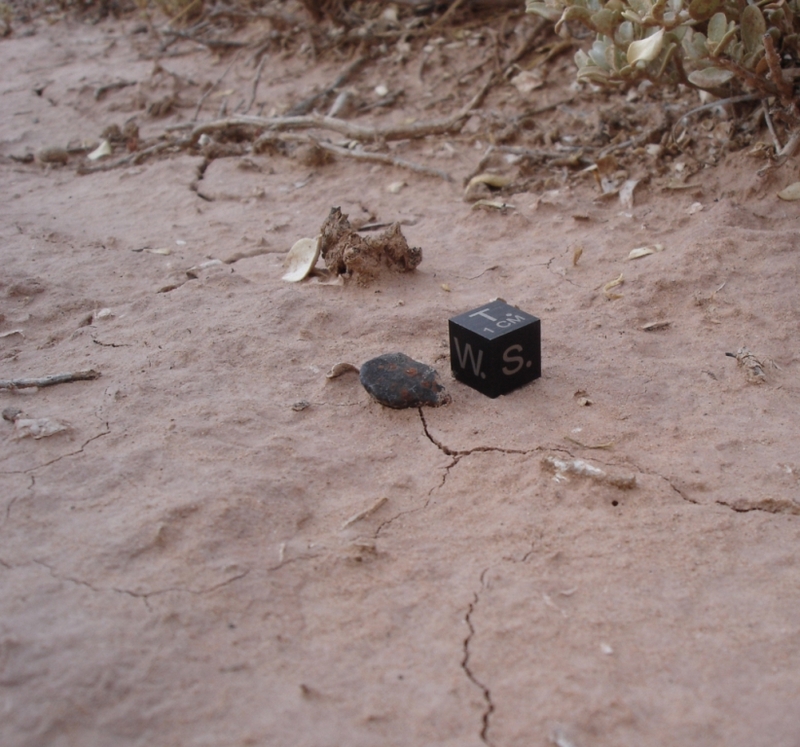 What he pulled out of his pocket, however, was anything but a meteorwrong. 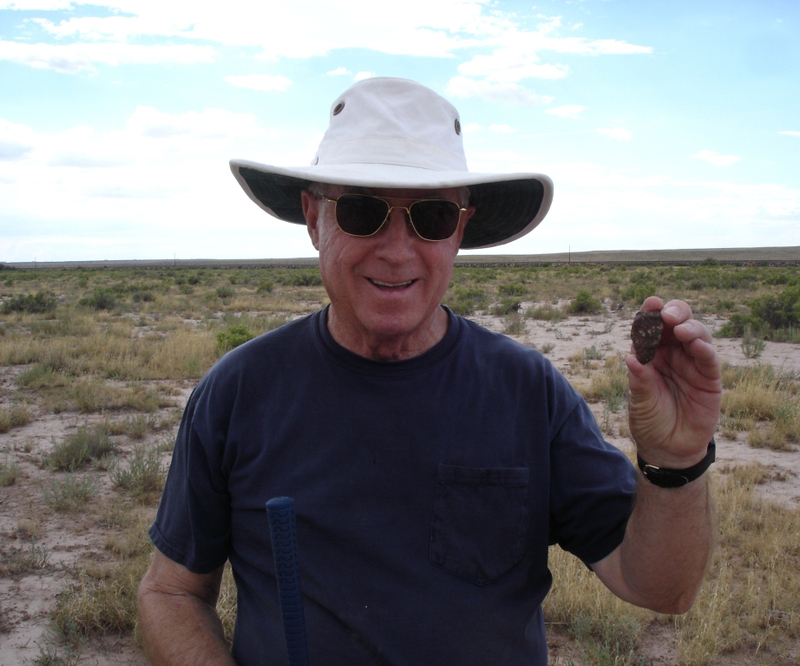 "Bob", I said, "that's a HUGE Holbrook meteorite!" He couldn't believe it at first but I knew what I was looking at the second it came out of his pocket. 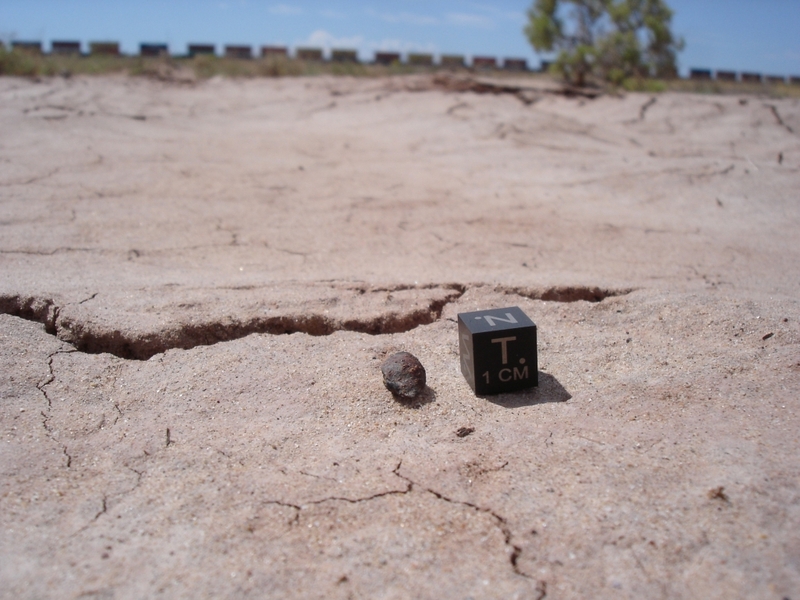 Tipping the scales at 31.8g, this is one of the 3 largest meteorites found in the last 10+ years at Holbrook. It couldn't have happened to a more deserving fellow. Congrats, Bob! He said he found something else that stuck to his magnet also. After seeing his first whopper I already knew this next one was going to be a meteorite, too. 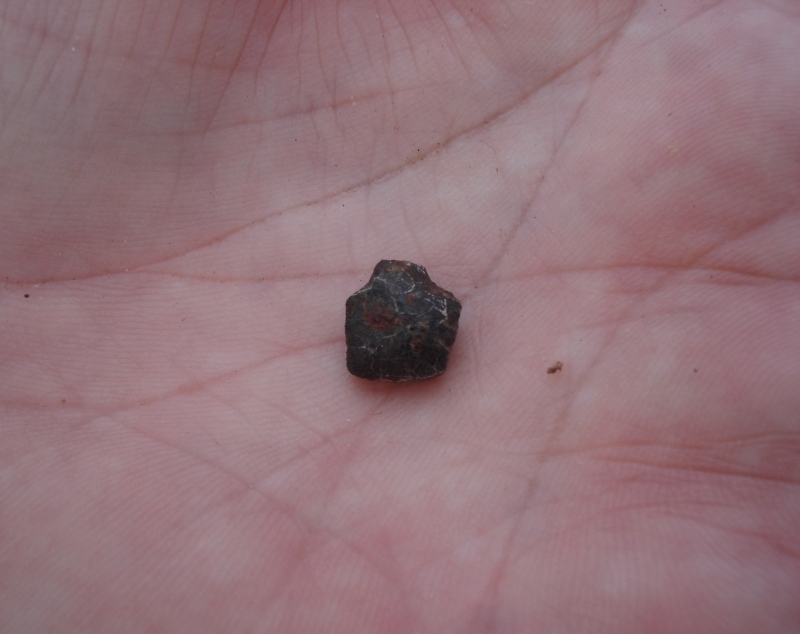 He went into his pocket again and pulled out a nice 0.9g meteorite. Way to go! The weekend was off to a perfect start. Went back out toward Bob's big find and started a more thorough search of the area. 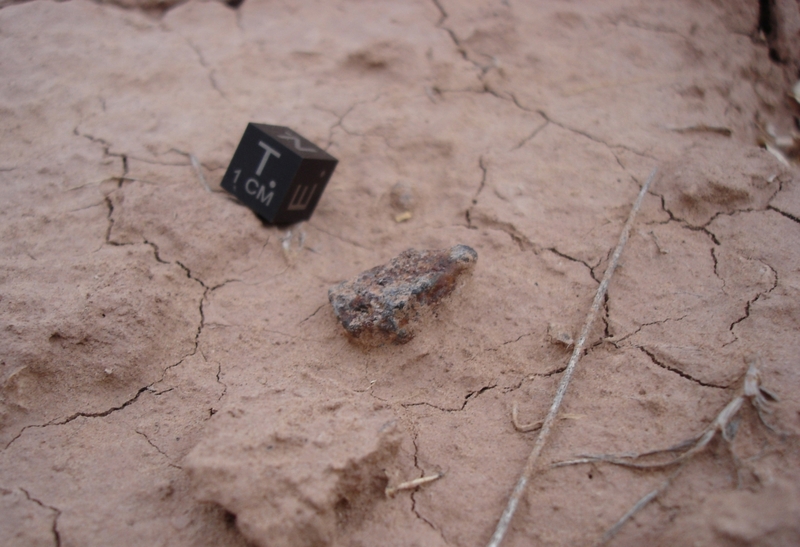 It didn't take too long before I made another find, this time a 0.4g fragment. Fourteen minutes later I followed that up with a 0.9g find. It seemed like Bob being in the "wrong spot" was working out nicely, we decided to point him the wrong way more often. 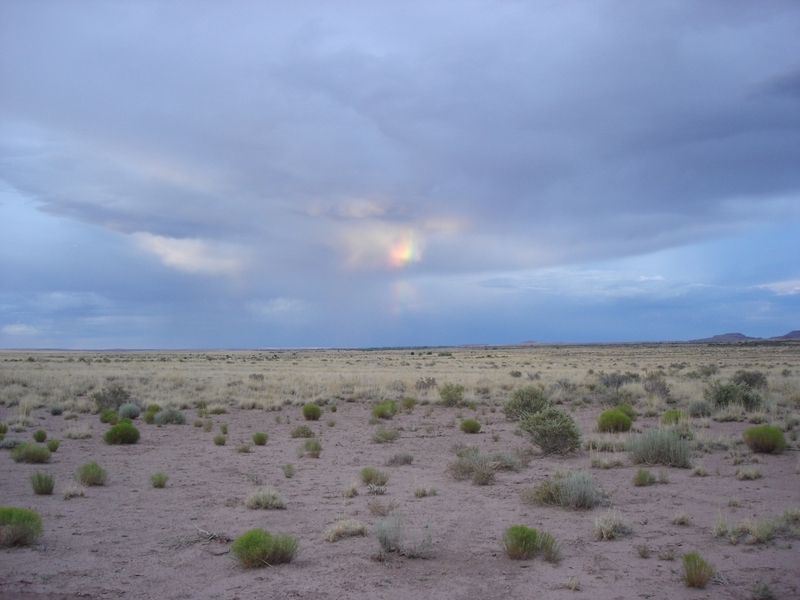 I left Bob and Robby, who continued to hunt the area and make a few more finds, and met back up with Mark to head over to the spot Robby and I had started in. Mark and I spent the rest of the evening there without any luck. 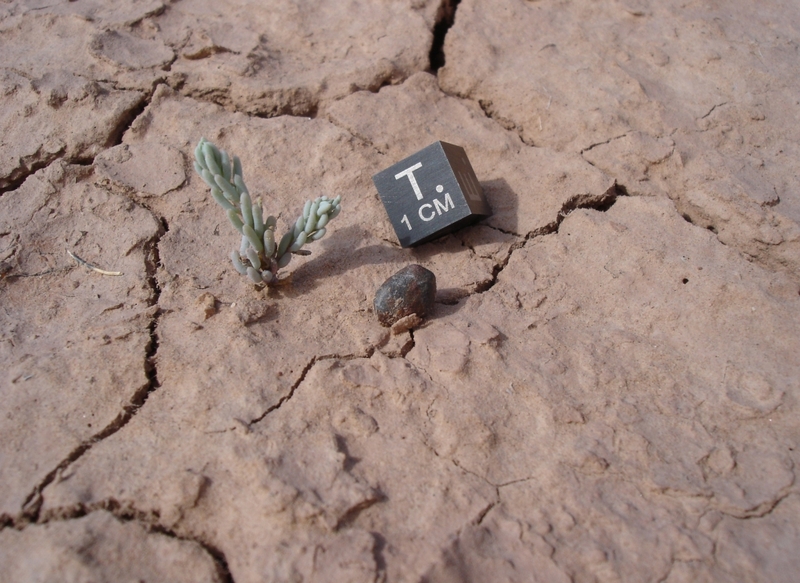 As we were getting ready to head back to the truck I spotted a tiny 0.3g one hiding next to a leaf. 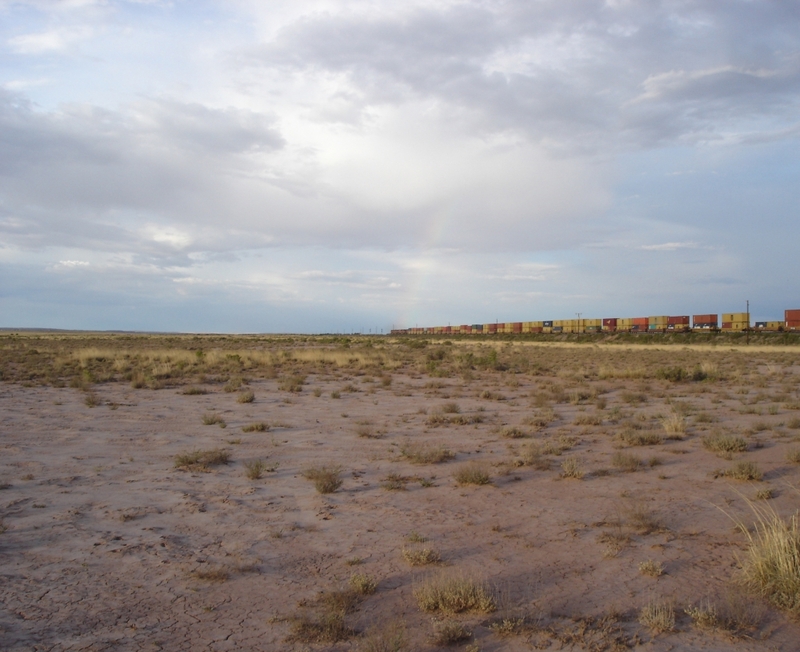 We got back to the truck just in time to see where the rainbow ended and watch our pot of gold chug off into the distance. Mark was a little discouraged at the end of day 1 not having found anything, but we still had a whole other day of hunting ahead of us. We returned to town to recharge. 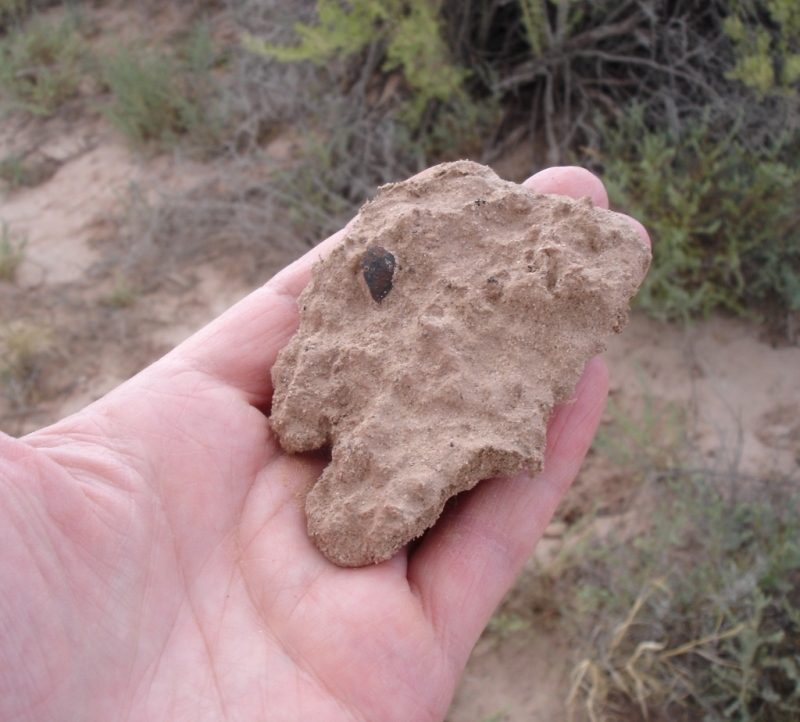 After a quick breakfast the next morning (Denny's, breakfast of meteorite hunting champions!) we headed back to the strewn field and hunted the north side for a bit. After a couple hours of wandering around I got lucky and walked over a 0.5g individual. 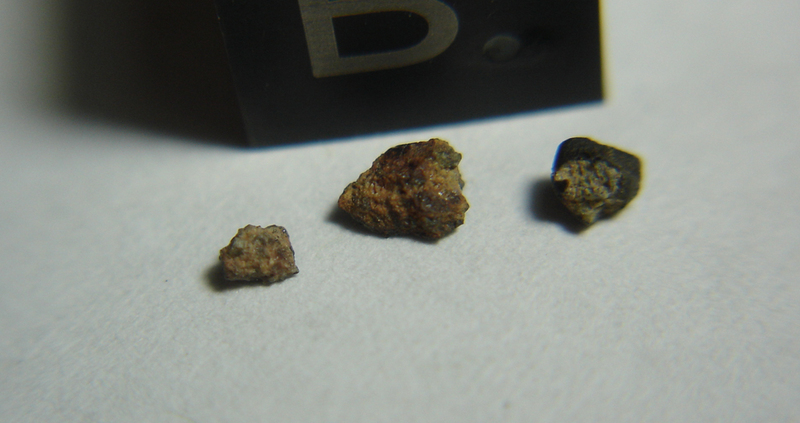 I tightened up my search around that find and 35 minutes later came across a 0.4g space rock as a train was rolling by. Choo-choo! We hunted the rest of the morning with no further luck, then decided to break back at the hotel for lunch and cool off a bit as the hottest hour of the day passed. When we returned to the strewn field we hiked out to search next to where Robby and Erik had found a couple earlier in the day. 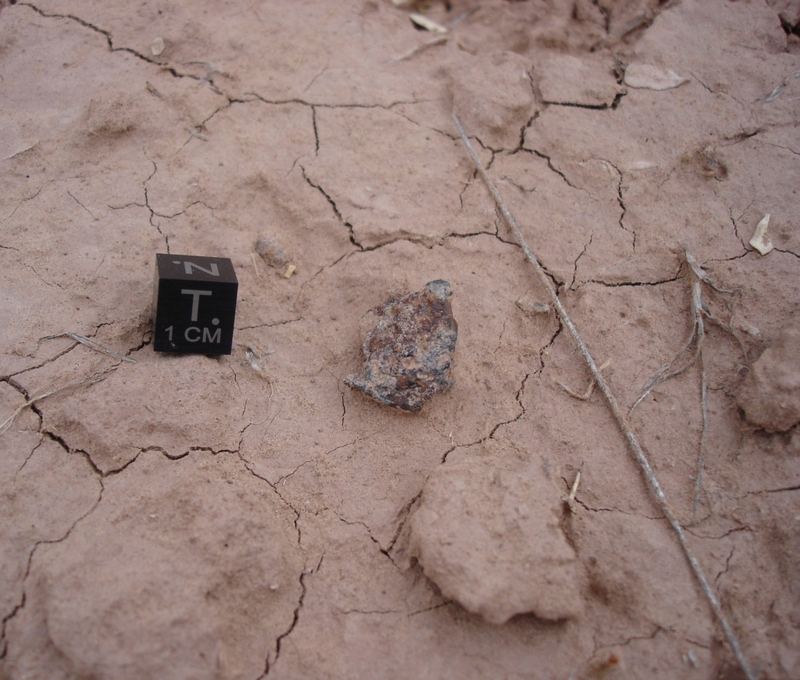 Almost immediately I found a 0.5g meteorite, confirming we were "in the zone". 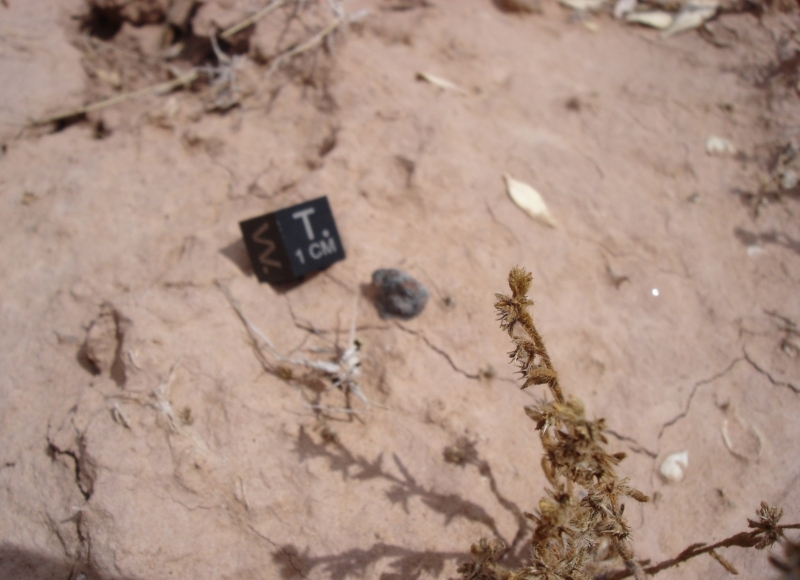 In my haste to document the find, my first picture focused on a plant rather than the meteorite, but the second picture captured the unusual landscape where it had resided for the past century. 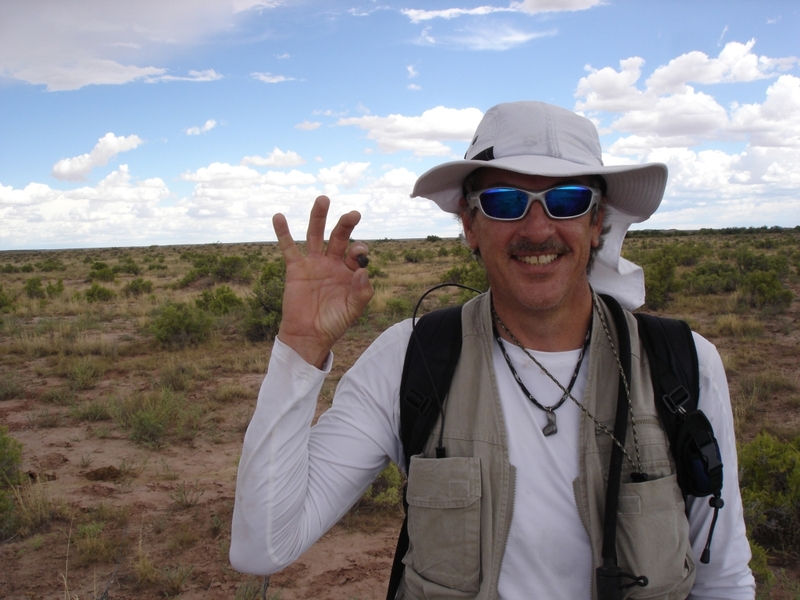 Mark was quite frustrated at this point, as one could imagine, having watched me find meteorite after meteorite over the course of two days and still having empty pockets. 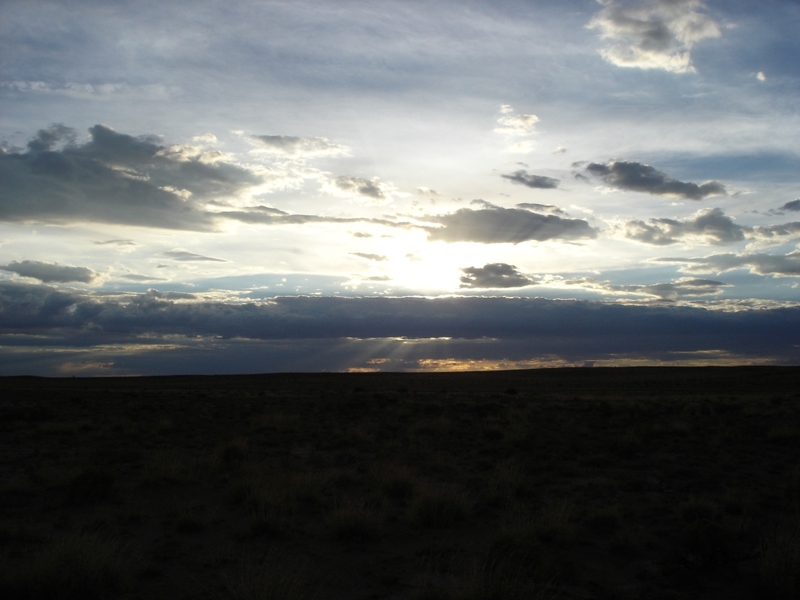 Suddenly the weather changed, dark clouds blew in over us, and a breeze picked up. 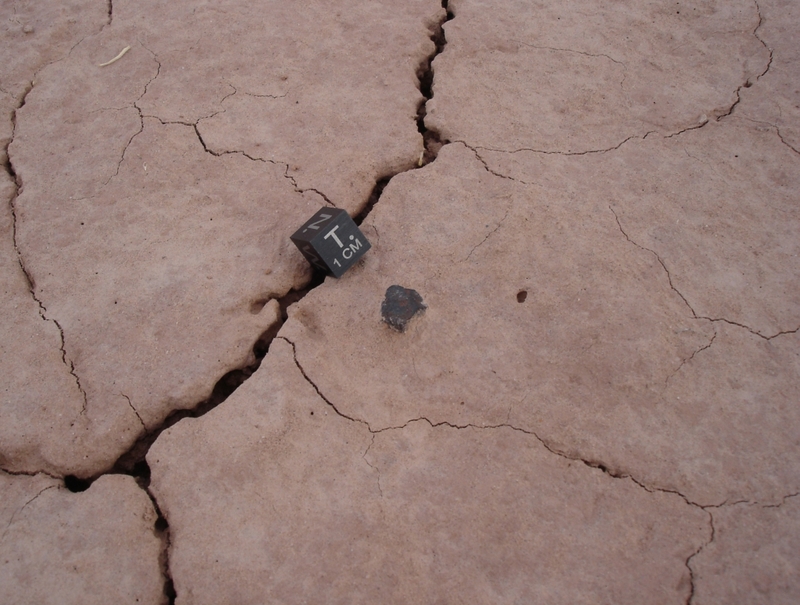 I told him to stay positive, he was going to get one, this was meteorite finding weather. 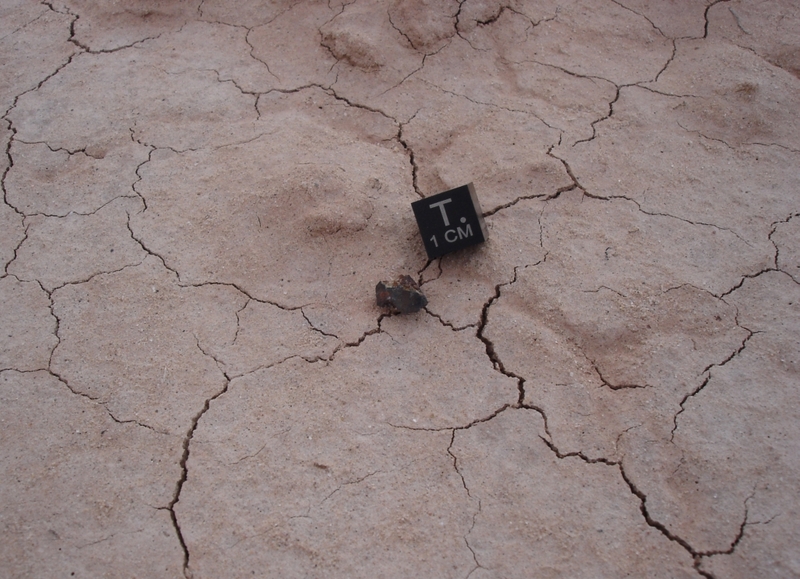 Sure enough, within the hour, Mark found a perfect 2.9g rock. Mark found 4 more that afternoon, including one that was in the process of eroding out from the roots of a clump of grass. My next find was on the rim of a cow hoof print, it was pushed out of the mud when the area was wet and a cow stepped next to it. 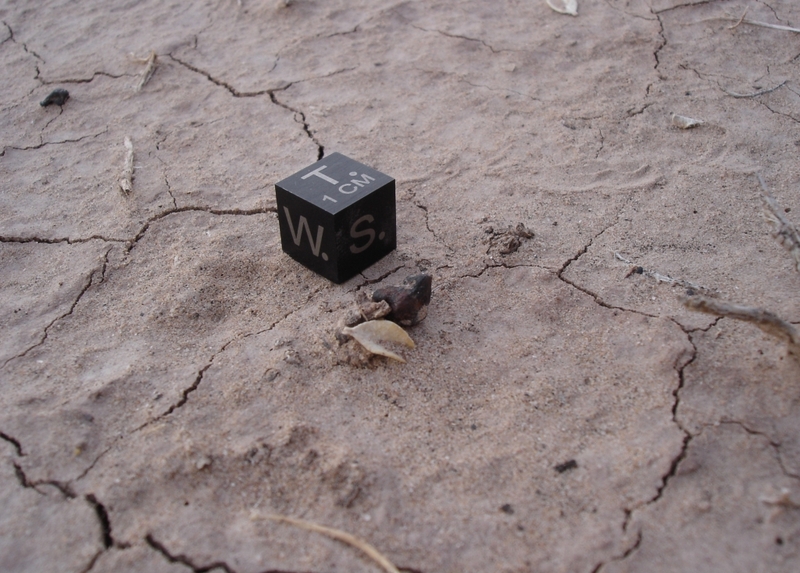 It was a small one at only 0.2g, but the circumstance of its find was pretty cool. I would have like to have taken it home to display like this, but the sand wouldn't have survived the voyage intact. One hour later, 60 minutes on the dot, I found another one, this time a perfect Holbrook pea. I gave the little plant next to it some water to thank it for caring for the 0.4g meteorite for me. 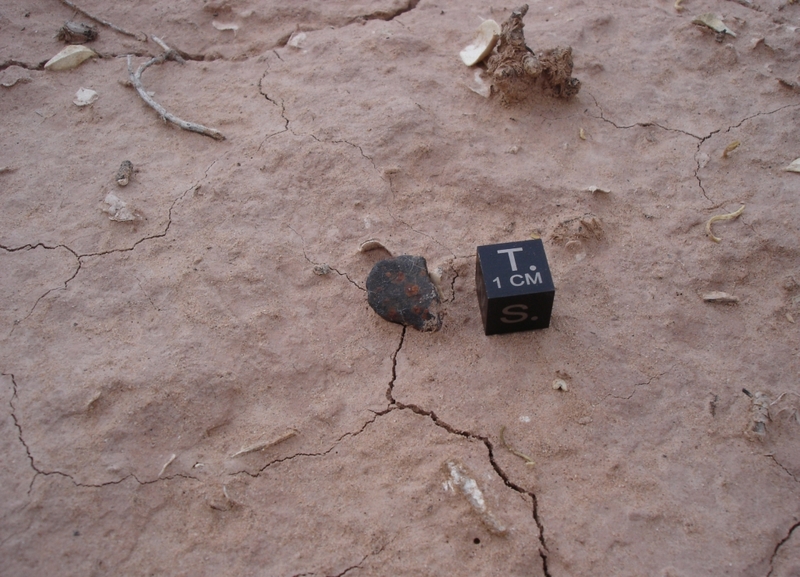 Find #11, a 2.6g individual. 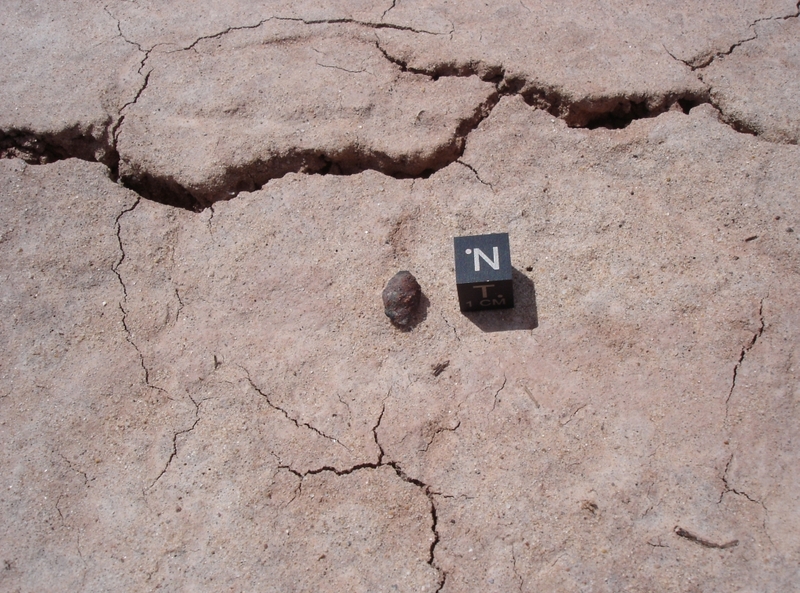 Find #12, a 1.0g individual. 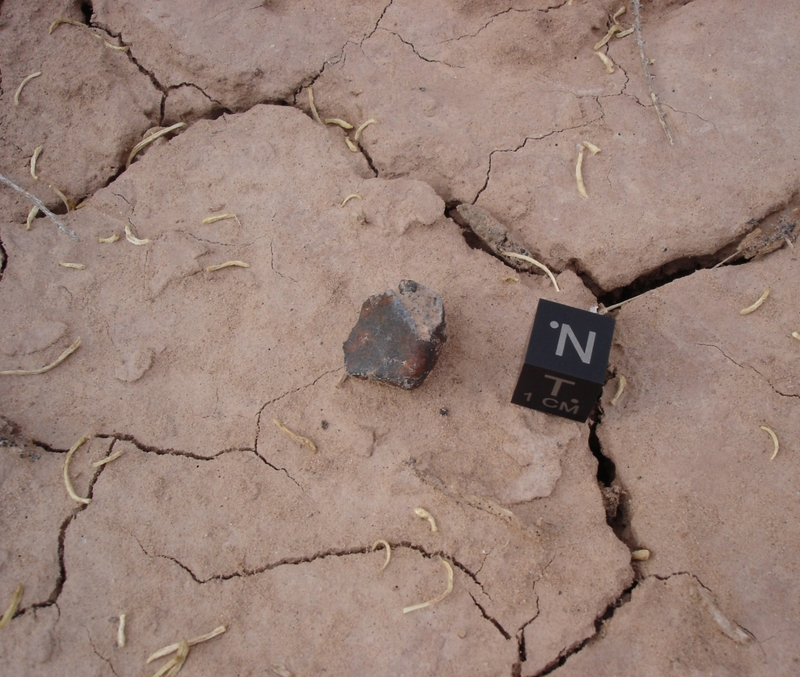 Meteorite finding weather! 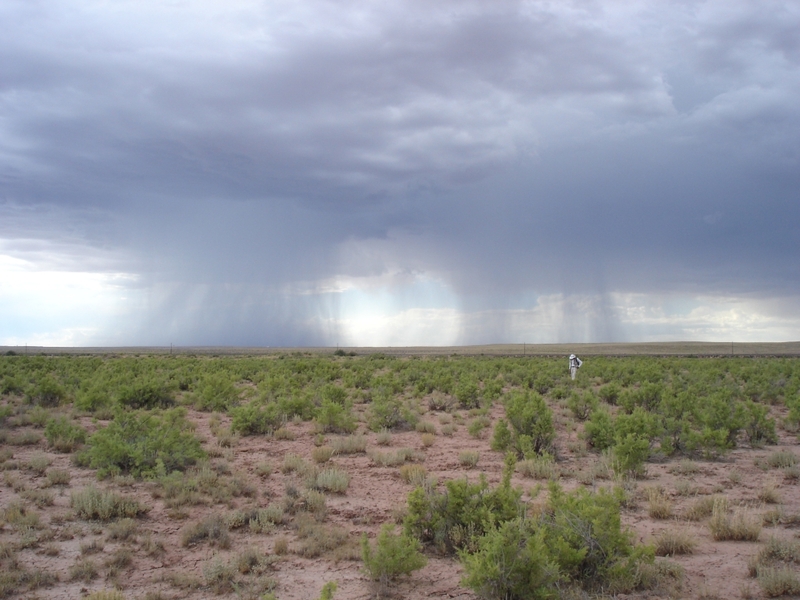 Lightning flashed and thunder boomed in the distance while monsoon rains fell all around us. The monsoons avoided us directly for the most part, I only got soaked once. It was getting late and we were getting tired, but I was sitting on 12 finds for the trip and I knew that lucky #13 was still out there. Mark headed back to the truck and I went "the long way". 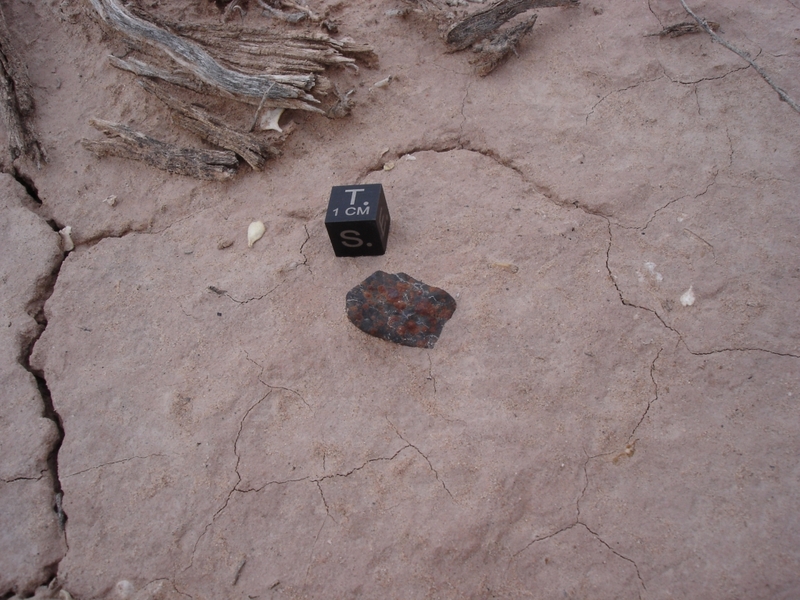 About an hour later (and no closer to the truck than when I started) I made find 13, it was a 2.9g fragment, I was stoked! I dug around, hoping the rest of it was near-by, but if I was I didn't find it. It looked a lot like the bit of iron I found the day before, but this one was the real deal. 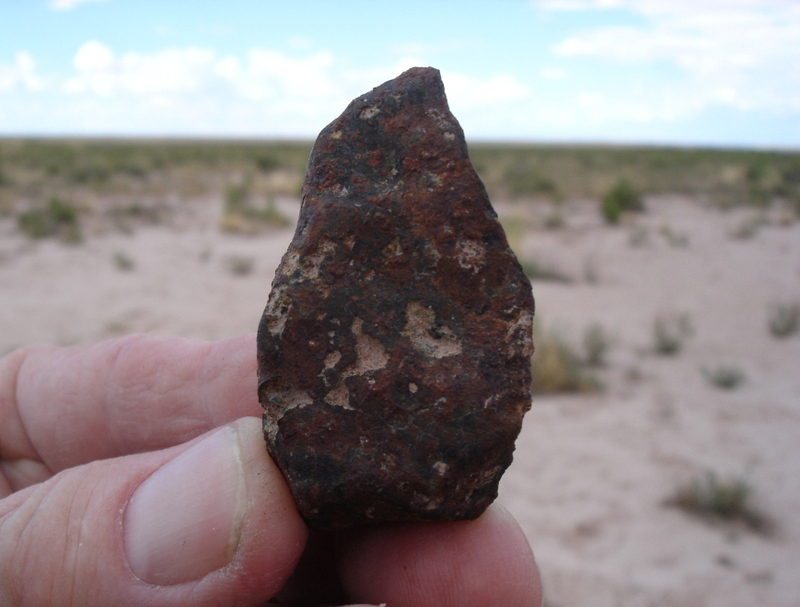 As I was making my way back to the truck (via a direct route this time) the meteorite gods smiled down on me with one last find, a 1.0g individual. 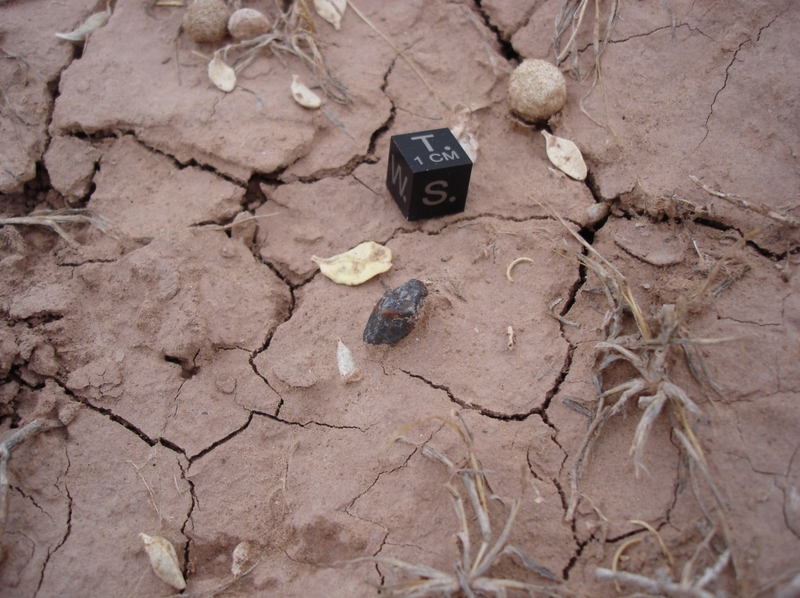 My weekend's finds, including a couple bullets from the Old West. Thanks, Holbrook, we'll see you again next year! I finally got around to sorting through two baggies of debris that I picked up with my magnet from two ant hills while I was hiking back to the truck. 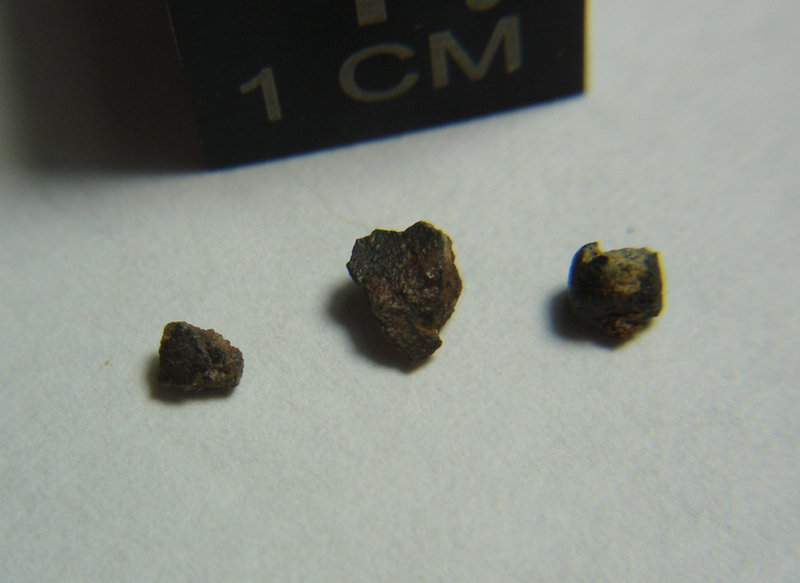 I was totally surprised to actually find 3 teenie tiny meteorite fragments out of hundreds of little pieces of rusty metal, slag, and assorted junk. 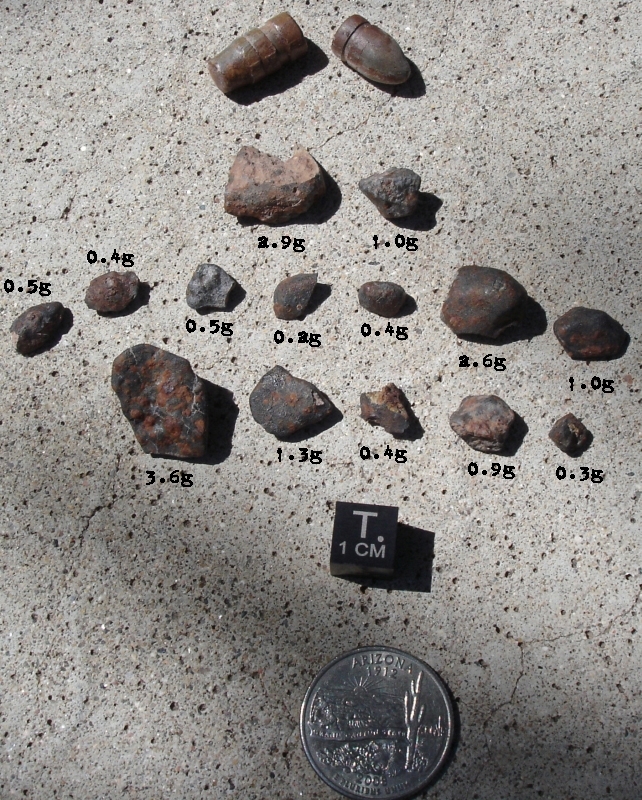 One is an almost complete individual meteorite (far right). Thanks, ants!